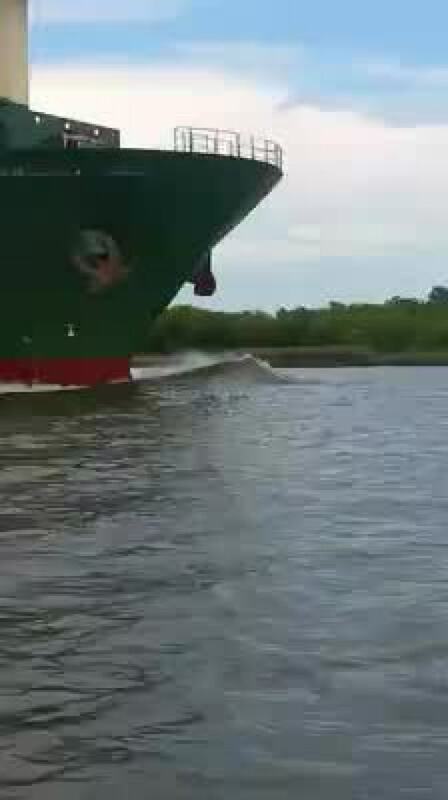 "I told my husband to keep up with the ship so I can get a better video"
A rare pink dolphin is making a splash in Louisiana thanks to a video showing the animal jumping in and out of the water in front of a ship in the Calcasieu Ship Channel this weekend. In fact, Bridget Anne Boudreaux said she saw two albino dolphins by her boat Saturday, along with some others, she told NBC News. Albino dolphins are extremely rare, according to the NOAA Fisheries Southeast Regional Office, with five potentially white bottlenose dolphins spotted in the entire Southeast United States as of 2016 and just three individuals likely behind the sightings of white or pink bottlenose dolphins in the Gulf of Mexico. A pink dolphin calf was first spotted in Calcasieu Lake, Louisiana, in 2007, and has been spotted many times since then, according to NOAA, which wrote that it's considered an albino despite its pink coloration. "All sightings of this dolphin have been off Louisiana and most of the time it was seen swimming with a group," according to NOAA. NBC reached out to the agency to ask about the video. Boudreaux said the two pink dolphins she saw never appeared together, so she couldn't get video of them both. One jumping out of the water near her boat caught the attention of her and her husband. "We watched them play around for awhile and then they went to the ship to play in front of it. And I told my husband to keep up with the ship so I can get a better video," Boudreaux said.